Everything is automatically split 50-50. While Texas is a community property state, a 50-50 split is not guaranteed. You need to understand which 50% you will get. All assets are not created equal. Your 50% may include the house. If you are forced to sell it when the real estate market is down, you end up with less than 50% - plus having to pay closing costs and commissions. You need to know if you can afford the 50% you get before you sign on the dotted line. I will keep all my separate property. Separate property is anything that was gifted during the marriage, inherited during the marriage, or brought into the marriage and left in separate name. If the wife owned a home before she married and changed the title on the home from her name to both names, she made a presumptive gift to the marriage. Now the house is likely to be in the community property pie and up for division. If she has an inheritance in an account with only her name on it, that is her separate property to keep. But, income earned from separate property is generally community property. Divorced individuals are better off financially than they were when married. This is particularly applicable to women. Studies show that one year after a typical divorce, the standard of living of the woman and minor children has dropped by 27%. Women are 70% more likely to spend their retirement in poverty than men. Many times women in divorce have priorities other than long-term financial planning. They choose to solve the short-term problems at the expense of the long-term benefit. Agreeing to a financially fair settlement is one thing, but getting actual possession of a settlement asset can be another. Only divorce lawyers produce financial statements. A Certified Divorce Financial Analyst (CDFA) can produce financial statements and projections that show you the long-term effects of proposed settlement offers. 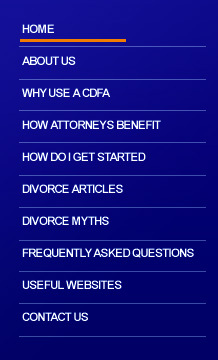 A CDFA works with your attorney as a team to achieve the best results for you now and for the long run. Your settlement will determine your standard of living for many years to come. Consult a divorce financial expert before establishing or agreeing to the terms of your divorce settlement. Division of property in divorce is tax-free. Sometimes it is and sometimes it isn't. Your property split will not be equitable unless income taxes are taken into account. This is true for stocks, mutual funds and real estate. If retirement money is split using the wrong procedure, there can be income taxes and penalties to pay. The wife should automatically get the home. Many women try to keep the home without carefully considering the long-term costs. Misjudging what she can afford will put her in financial trouble down the road. If she needs to sell the home later, she will have to bear the entire cost, risk and expense of the sale. Again - all assets are not created equal. You have one shot at negotiating your property settlement. You need to understand how income taxes impact the property you receive. If you get stock and your spouse gets the bank account, you might have to pay income tax on the gains when you sell the stock to get cash. If you get the house and your spouse gets the retirement, you won’t have an income producing asset to fund your retirement years. The husband is obligated to pay for the children's college. In Texas, the judge cannot require one parent to pay for college. However, both spouses can agree to put a provision in the settlement agreement about who pays for what when it comes to the children's college costs. Child support stops after the child reaches 18 years of age, unless both spouses include further child support as part of the divorce agreement. Child support will take care of our children. Children are often the big financial victims in divorce, as the family typically drops 1-2 economic levels. This causes children to change schools, friends and activities. Child support in Texas, as in most states, is based upon a percentage of net income from the paying spouse. This might not be enough for your children. Consider sitting down with your spouse and calculate the expenses associated with the children and determine who will pay for those expenses. Base the support on need versus a guideline. Texas is a limited spousal maintenance state, which means there are definite restrictions and limitations placed upon spousal maintenance being granted by the courts in Texas. Remember, though, that you and your spouse can agree to anything and spousal maintenance may be a win/win situation for both of you. This is especially true if there is a large disparity in income levels. I have to fight to get what I want! Many people, when faced with divorce, try to find the best “hired gun” or “pit bull” attorney to protect their interests. There are several alternatives to this type of litigation. One alternative, collaborative divorce, enables people to work with their spouse, with separate counsel, and a team of professionals to resolve the divorce. This helps facilitate a resolution ending with dignity, respect, and the ability to protect your interests. Joint debts are eliminated through the divorce decree. All joint debts remain joint debts regardless of what the divorce decree dictates. Creditors will still hold both spouses accountable if a bill is late or not paid. The best way is to ensure that joint debts are eliminated during the divorce process is by either refinancing or paying them off with assets. Insurance needs don't change because of a divorce. Actually, the majority of your insurance needs will change due to a divorce. Medical, dental, life, disability, as well as homeowners insurance will all need to be reviewed during the divorce to address these needs. Insist on a life insurance policy on the “payor” spouse to protect future streams of income due to child support or spousal maintenance. No additional paperwork is needed to transfer assets post-divorce. Most companies, in addition to the divorce decree, require additional paperwork to transfer assets into a single owner’s name post-divorce. In addition, all qualified plans required a Qualified Domestic Relations Order (QDRO) to transfer ownership. Ensure this paperwork gets done at the signing of the divorce decree to ensure that you get the assets agreed upon in the divorce decree.